Buddy Greene will make a return engagement to perform with the Southern Stars Symphonic Brass (SSSB) on Saturday, April 16 at 7 pm Central at the Stone Memorial HS auditorium in Crossville, TN. This auditorium seats 1200 and has beautiful acoustics and seating is very comfortable. The theme of this concert is Buddy Greene & Friends. The concert program music selections will be announced soon. Buddy Greene and friends perform with the Southern Stars Brass on Saturday, April 16, at 7 pm Central. Buddy and sideman Jeff Taylor last appeared with the Southern Stars in 2013 and nearly 900 attended that concert. Patrons left the concert truly amazed at the talent and stage presence of Buddy and Jeff. 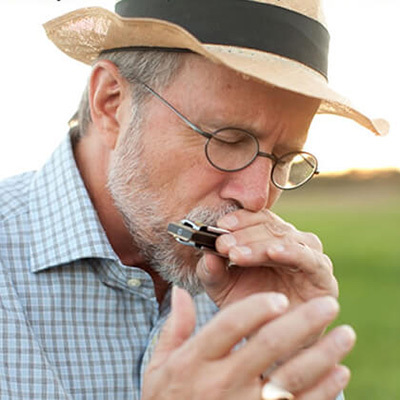 Besides performing with the SSSB for a couple of selections, he will also favor the audience with a separate, 30-minute concert of his music stylings where he will play harmonica, guitar and sing, accompanied by his Nashville sidemen. The 30-piece professional brass ensemble will also perform selections of their own for this nearly two-hour concert (including intermission). The SSSB and Buddy will have their CD/DVD assortments available for purchase. Tickets will be $25 for Adults, and students will be $5. Tickets will be available in the Crossville, TN area beginning on March 1 at the following locations: Cumberland Eye Care in Fairfield Glade, First National Bank of TN branches in Crossville and Fairfield Glade, Bed & Biscuit Kennel, and at Cumberland Co. Playhouse at their box office, by phone (931-484-5000), or via the Playhouse website. Tickets will also be available at the door. For out of town people wishing to purchase in advance, please contact Dwight Wages at 931-484-6939.